On November 19th and 20th, Kumamoto University concluded an inter-university academic and student exchange agreement with Durham University (UK) and the University of Bucharest (Romania) respectively. Durham University is recognized as one of the top universities in the United Kingdom. Out of 33 subjects, 20 subjects received top ratings in the latest Research Excellence Framework (REF). The university hosts approximately 4,000 international students from 156 countries. Since 2014, when Durham University launched the Japanese Studies Course, the faculties of these universities have deepened exchanges to include visits to each other’s campuses. At the signing ceremony held at Durham University, Durham University’s Vice-Chancellor Stuart Corbridge signed the agreement and concluded with a firm handshake with Kumamoto University’s Vice-President Kazuki Takashima. This agreement is expected to promote exchanges among university faculty, researchers and students. The University of Bucharest is a national university with the longest history and tradition in Romania. It has been the center of Japanese studies and Japanese language studies for Eastern Europe. 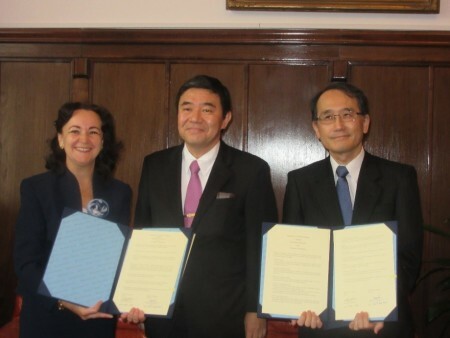 The signing ceremony was concurrent with the 40th anniversary of the founding of the Japanese Language Department of the University of Bucharest. These two exchange agreements have raised the total number of partner universities and institutions of Kumamoto University to 189, covering 40 countries and regions. 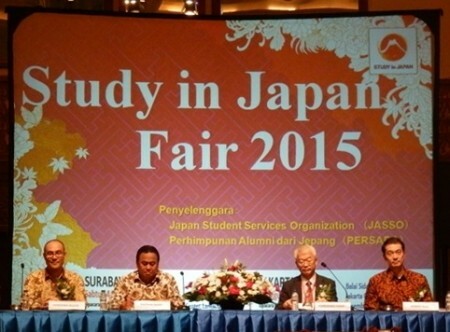 On November 14 and 15, Study in Japan Fair 2015 was held in Surabaya and Jakarta in Indonesia under the auspices of the Japan Student Services Organization (JASSO). The purpose of the fair is to provide Indonesian students who are interested with information on study in Japan and Japanese higher education, and to help them choose an appropriate school and ensure a productive period of study in Japan. As many as 1,190 students (1,682 last year) visited the Surabaya venue, while 4,115 students (2,856 last year) visited the Jakarta venue. More than 100 students visited the Kumamoto University booth at each venue. 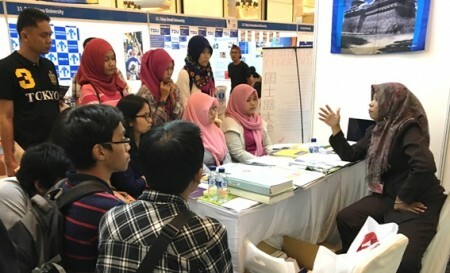 University staff, including local staff members, explained the procedures needed to study in Japan in English and Indonesian, using brochures, posters and the university’s YouTube channel. Some Indonesians who experienced study in Kumamoto University visited the Jakarta venue and enjoyed a reunion with the university staff. They provided us with great support and valuable advice based on their experiences in Japan. Kumamoto University has concluded five university-level exchange agreements and two department-level exchange agreements with Indonesian universities, including the Consortium of Institut Teknologi Sepuluh Nopember and Airlangga University. We have had active exchanges with those universities, and welcomed 71 students from Indonesia during the 2014 academic year. In April 2010, we established the “Kumamoto University Liaison Office at ITS” in the campus of the Institut Teknologi Sepuluh Nopember (ITS). The local staff promotes student and academic exchange activities and supports students who are preparing to study at Kumamoto University. This Study in Japan Fair is expected to help raise awareness of our university in Indonesia and increase the number of students who wish to study in Kumamoto. On November 20, 2015, President Shinji Harada received a courtesy visit from Fr. Jose M. Cruz SJ, Vice President for University and Global Relations of Ateneo de Manila University in the Philippines. Established in 1859 and located in Quezon City, the largest city in Metro Manila on Luzon Island in the Philippines, Ateneo de Manila University is one of the leading private universities in the country. In this visit, Dr. Cruz met with Assistant Professor Armando Quitain of the Department of Applied Chemistry and Biochemistry in the Faculty of Engineering, faculty members of the Graduate School of Science and Technology, and faculty members of the College of Cross-Cultural and Multidisciplinary Studies. They exchanged views on the mutual dispatch and reception of students, along with the exchange of instructors, and agreed to develop a good relationship between both universities. This visit is expected to enhance international student and academic exchange between Kumamoto University and Ateneo de Manila University as well as other higher education institutions in the Philippines. On November 5, 2015, Japan Tag 2015 – Research and Study in Japan – organized by the Bonn Office of the Japan Society for the Promotion of Science (JSPS), was held in Heinrich Heine University (HHU) in the German city of Düsseldorf. 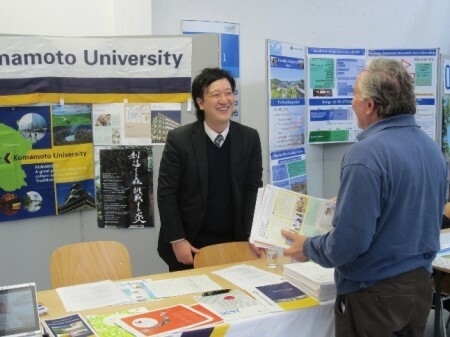 The purpose of this fair was to promote study in Japan and to provide students and researchers from HHU and other institutions in Germany with information concerning study-in-Japan programs, research systems and higher education research so that they can choose appropriate destinations to study and accomplish productive research in Japan. Twenty universities and research institutions from Japan set up booths in HHU to provide information. The venue was visited by about 400 people, and was crowded all day. Topics relating to mutual exchanges between Japan and Germany were on the agenda for the seminar. They included a lecture titled “The Internationalization of German and Japanese Higher Education.” Interestingly, a German higher education staff member explained the Top Global University Project launched by the Japanese Ministry of Education, Culture, Sports, Science and Technology (MEXT), while a Japanese researcher explained the status of higher education in Germany. This ability to explain each other’s education systems demonstrates that the two countries already have a deep mutual understanding and a good relationship. Subsequently, Japanese universities and research institutions delivered brief introductions while German participants took notes with interest. 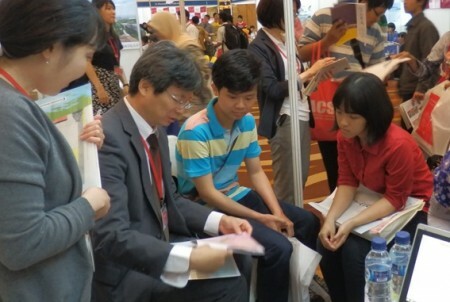 Approximately 100 students and researchers visited the Kumamoto University booth. The staff at the booth talked about the university and the procedures needed to study in KU using brochures, posters, the official website and YouTube. Heinrich Heine University Düsseldorf has five faculties: (1) Business Administration and Economics, (2) Arts and Humanities, (3) Law, (4) Mathematics and Natural Sciences, and (5) Medicine. It also is home to the University Hospital and the Department of Modern Japanese Studies, where students study the Japanese language. Several of the students who visited the KU booth expressed their interest in studying, especially in the graduate schools of medicine, health, and pharmaceutical sciences and the Japanese language courses of KU. We were impressed by their strong desire to study at KU. We fully expect to use this opportunity to further exchanges with students and researchers at HHU and other universities in Germany.